A Bitcoin wallet is a software generated program where you can store Bitcoins. The wallet contains a private key. Main parts of Bitcoin wallet are Private Key or Your ID, Password and Your Wallet Recovery Phase. For every transaction one address required from the sender as well as from receiver to make a successful transaction. After making transaction address automatically saves in Bitcoin wallet. Bitcoin Wallet is same as of our bank account where they act as an intermediate between sender and receiver, also they store our money. The multiple types of Bitcoin wallet like desktop wallets, mobile wallets, web wallets, and hardware wallets. Different wallets have different features including their interface, security features, Wallet with a trading facility, withdrawal in centralized Currency. A Bitcoin wallet is available in app, website, or in Hardware device. One Fact of Bitcoin Wallet is In reality, Bitcoins do not need to be stored and secured, but the private keys or secured code that give you access to them. 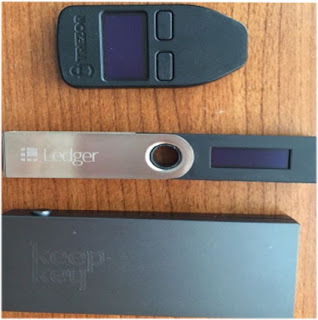 A hardware wallet is an electronic device, designed for a store and securing bitcoins. Hardware wallet must be connected to your computer, phone, or tablet before you make any transaction of Bitcoins. The main feature of Bitcoin hardware wallets is to keep private keys separate from internet connected devices. Hardware wallets mainly required for security and reliable or trustable Bitcoin storage. The biggest advantage of Hardware wallet is If your online device gets malware by infected material like a virus in your computer Still your Hardware wallet safe because they are in an offline environment and fully protected. Secondary security of your hardware wallet protected by your pin protection. Always keep your secret backup code If your hardware wallet getting damage. So, you can easily recover your find. Most of the Big investor keep their fund in hardware wallet. your need to handle or Store it physically. The hardware wallet never free you need to pay some amount. These Bitcoin wallets are on internet-connected devices like a computer or PC. This type of wallet generates your Private key or secured key in their software so we never trust that this type of wallet is 100% secure. If your wallet software getting hacked ultimately your private key gets hacked. You can convert Bitcoin to other Altcoins.